Have you ever picked fresh BLACKBERRIES ? were purple blue when done! 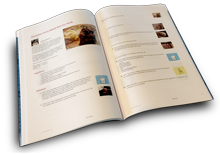 Thanks Nancy for including two of my recipes in your book. I do love blackberries, and this book has some enticing recipes which I would love to try. You do such a nice job of gathering recipes and compiling terrific books. Another great cookbook by Ma. back yard. Just might have to pick some. Nancy, you are a super sweet lady !! Wish you and Colleen lived near by so I could dart over. Blessings to you both. Nancy, you do an awesome job Dear One, Thanks !! I said blueberries...I meant to say BERRIES! The cookbook is all BLAKBERRIES....sorry. What a lovely cookbook !! Thanks for posting Jean's Blackberry Wine Cake. There are Many Great Blackberry Recipes here. Will soon be picking time.